Blow molding is used in the manufacturing process to create products that are used to produce hollow parts that we see everywhere, including septic tanks and eye dropper tools. It is derived from the glass blowing industry. The impressive technique is used in other aspects of blow molding, along with all bottle (i.e. detergent, bleach) and food product containers. Most containers contain parts that include polypropylene, LDPE, and LLDPE. This is a high-density thermoplastic that is highly preferred with blow molding. 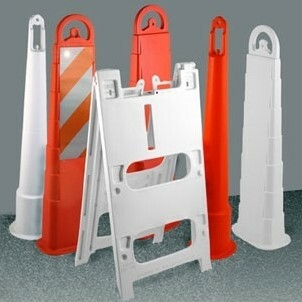 The orange construction cones that we see on the highway were created from our extrusion blow molding technique. A molded tube of resin is extruded with an annular dye and captured between two molded halves that shape out your desired pattern. The mating surfaces on the mold pinch together creating high pressure air in a captured tube that assists in the shaping process. An inflating process takes place to conform the inside shape of the mold. Most barricades were once constructed of wood and are now, constructed with very durable plastic that is commonly shaped by the blow molding process. More importantly, plastic barriers are becoming increasingly popular on construction projects around the country. What Products Are Created Using Blow Molding? Plastic safety products used by blow molding are used to keep pedestrians safe and control traffic. Thousands of containers each year are produced by blow molding techniques. Conveniently, let traffic know what areas are off limits or prevent your employees from entering a dangerous work zone. Eco-friendly products have recycled materials that calls for less virgin materials. You can get custom products made on a short or long run basis. Semi-custom blow molded products are also very popular. They provide lightweight, easy to assemble products, and easy to breakdown plastic barriers.